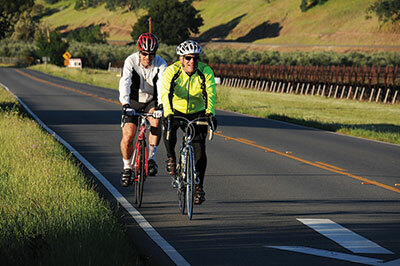 Bicyclists travel along Suisun Valley roadways on April 14, participating in the first-ever Tour de Rustic Wine Country” event, raising money for NorthBay’s Hospice & Bereavement programs. By all accounts it was a beautiful day for a fundraising bike ride, and a good turnout for a first-time event. The first-ever “Tour de Rustic Wine Country” was held April 14 and all funds raised during the ride were to benefit the programs of NorthBay Hospice & Bereavement. The three routes—10-, 20- and 65-mile loops—wound their way past Suisun Valley wineries, farms and fruit and vegetable stands, and had enough variety to appeal to families as well as serious cyclists. The ride was organized by Anne and Steve Niffenegger of SV Events. The Tour de Rustic Wine Country ride was held the same day as another Suisun Valley event, Passport Sunday. Now in its sixth year, Passport Sunday has become a popular tasting tour that brings together a number of Suisun Valley wineries and area restaurants, and a portion of the proceeds were also set aside to benefit the programs of NorthBay Hospice & Bereavement.